While the rich were taken care of by their physicians at home, the impoverished immigrants could not afford the exorbitant treatment and many lay on the ground, sore and unable to be saved from their pain-filled fates. Most suffered from diseases ranging from malnutrition, malaria and cholera to typhoid, smallpox and even the deadly tuberculosis. Besides donating a full $5,000 to set up a hospital for these poor people, Mr Tan also offered a piece of land to build the hospital, naming it the Chinese Pauper’s Hospital. The foundational stones for the hospital were laid on Pearl’s Hill (near present-day Outram Park) on 25 July 1844. However, it was not until 1849 that the building was ready. Construction took three years, but the hospital had to remain unoccupied due to the lack of funds, because the British government was unable to foot the bill due to the bureaucratic system. During this time, the hospital had to overcome innumerable hurdles, including the severe problem of insufficient funds. In addition, there was a shortage of hospital staff, aggravated by the absence of a reliable water supply. Fortunately, there were many generous benefactors who were willing to lend a helping hand in the financial running of the hospital. 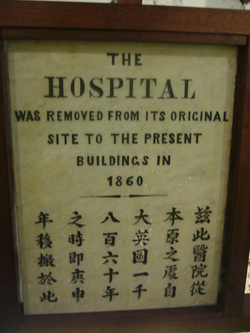 The hospital was later renamed “Tan Tock Sing Hospital” and in the 1850s, the spelling discrepancy was corrected. In 1852, the hospital requested for public donations. The crises, which the hospital faced, did not come to an end just yet. In 1856, the government decided to fortify Pearl’s Hill, with guns positioned atop (at the site of the hospital) and cannons at Fort Canning. These regions were both defence bases, and also a place for Europeans to seek refuge at. The hospital was then moved to the junction of Serangoon Road and Balestier Road. Funds to construct the new hospital came from both the government and the Tan family. This new hospital had two new wards; one for women and another for lepers. The hospital earned the nickname, “House of the Poor”, and Rumah Miskin which has the same meaning in Malay. In June 1861, the patients were relocated to the new site. Many left the hospital though, to beg for money due to the poor hygiene conditions there. Rattan strokes were implemented for runaway cases, but this just aggravated the situation. Many turned to crime for money, while others committed suicide. In 1873, the new governor Sir Henry St. George Ord, put the hospital under the direct supervision by a government official, the first move by the government to help the institution directly. From then on, the situation at the hospital became much better. In 1882, the hospital met yet another obstacle. There were 444 cases of malaria and 50 cases of beri-beri, attributed to the non-conducive environment of the hospital, which was on low ground and lack of rainwater drainage which encouraged the breeding of mosquitoes. The hospital committee suggested relocating the hospital. In 1909, Tan Tock Seng Hospital was relocated to Moulmein Road and occupied a area of approximately 10,500 m2. It was able to accommodate 1,028 patients in different blocks. New wings were added in 1919. During the Japanese Occupation from 1942 to 1945, Tan Tock Seng Hospital was renamed Hakuai Byoin (博愛病院 in Kanji) or Universal Love Hospital. It was used as the Japanese civilian hospital. In 1956, a 6-storey Main Ward Block was built. 5 years later, the government took full control of the hospital. Later, in the late 1980s, some old wards were demolished and replaced with five new blocks. 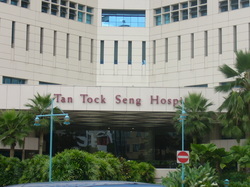 In 1992, Tan Tock Seng Hospital underwent a restructuring programme. It became the regional and national referral centre for five disciplines: Respiratory Medicine, Geriatric Medicine, Rehabilitation Medicine, Neurosciences and Rheumatology & Immunology. Since 1993, the hospital commenced one-stop clinical services, including the Continence Clinic, Memory Clinic, Diabetic Clinic, Stoma Clinic, Breast Clinic, Vascular Clinic and Voice Restoration Clinic. Similarly, in 1994, Tan Tock Seng Hospital introduced one-stop centres, including Laser Bronchology Suite, Neurodiagnostic Laboratory and Non-invasive Cardiac Laboratory. In 1995, the Communicable Diseases Centre (CDC) was restructured and was under the direct administration of Tan Tock Seng Hospital. A new building was proposed in the early 1990s to keep up with the high technology which the Singapore economy was moving towards. This was because Singapore had begun to move towards a Knowledge-Based Economy during that period of time, and thus, the need to move towards high-technology medical care. This building cost a hefty sum of $580,000,000 and was situated along Jalan Tan Tock Seng. The street was, too, named after the founder of the hospital itself. The construction commenced in 1994 and took a span of 5 years. Opened on 1 April 1999 by then Deputy Prime Minister Lee Hsien Loong, the hospital began operation a month later. It was redesigned and had a new logo. Currently, Tan Tock Seng Hospital is a 15-storey building and covers a total area of 19,000 m2, near Novena Mass Rapid Transit (MRT) Station. There are 1,211 beds in the hospital, with 34 wards and 4 blocks. There is even a museum which houses healthcare artefacts. The hospital has, since 2000, been a member of the National Healthcare Group. The hospital is a pioneer in the development of Geriatric Medicine, Infectious Diseases, Rehabilitation Medicine, Respiratory Medicine and Rheumatology, Allergy and Immunology. In addition to this, Tan Tock Seng Hospital is a major referral centre for Geriatric Medicine, General Surgery, Emergency Medicine, Diagnostic Radiology, Gastroenterology, Otorhinolaryngology and Orthopaedic Surgery. The hospital complex was specially designed for the provision of comprehensive inpatient and outpatient services. The complex covers many buildings, including the Hospital Block, the Tan Tock Seng Hospital Medical Centre as well as the Podium Block. The many specialist clinics in the hospital have an average number of approximately 1,500 patients daily. The Emergency Department treats an average of 400 patients every day, making it the busiest emergency department in the whole of Singapore. The CDC is the national referral centre for diagnosis and management of Human Immunodeficiency Virus (HIV), SARS and other communicable diseases. There are two campuses with both inpatient and outpatient facilities to control disease outbreaks. In addition to this, there are laboratory facilities for research on better disease control and patient care. Tan Tock Seng Hospital is not merely restricted and compromised by the land space at the hospital complex. In fact, it reaches out to the community by spreading out its services all over the island. The rehabilitation centre at Ang Mo Kio – Thye Hua Kwan Hospital offers the largest inpatient rehabilitation services in the whole of Singapore. Specialist clinics operated by Tan Tock Seng Hospital at Hougang Polyclinic and Yew Tee MRT Station reach out to the community. Today, Tan Tock Seng Hospital is Singapore’s second largest acute care general hospital, and has state-of-the-art facilities and medical equipment. The Art of Healing programme, launched on 6 February 2006, used the arts as a therapy to soothe the patients’ mind and body and help them to recover. With a warm and enriching environment, it distracted the patients from their ailments and thus reduce their anxiety. This would result in the lowering of their blood pressure and intake of pain medication. The final result would be faster recovery and shorter hospital stay. Activities such as exhibitons and performances are conducted regularly to promote TTSH as a centre of holistic healing of both the mind and body. The sterotype hospital environment of a cold and fearful one is changed to one where patients can relax in a warm and non-threatening one. Under this programme, Healing Sky Garden and Orchid Botanica were launched in 2006 and 2007 respectively.